Photographed by Mike Plagens at Cochise Stronghold, Little Dragoon Mountains,Cochise Co., Arizona, USA. 12 July 2009. In the upper reaches of sycamore lined canyons of southern Arizona raucus flocks of Mexican Jays are a familiar and welcoming sound. Their main habitat are oak woodlands but they move in and out of riparian galleries for foraging and water. For birds with nests containing eggs or young the calling generates alarm because these birds sometimes raid nests. Working together the jays distract a parent bird while the others grab nestling or eggs. Other foods include acorns, pine nuts and insects. Uncommon north of the Salt River in Arizona, but present at Pine Mountain Wilderness and also reported in the Bradshaw Mountains in Yavapai Co. near Prescott. 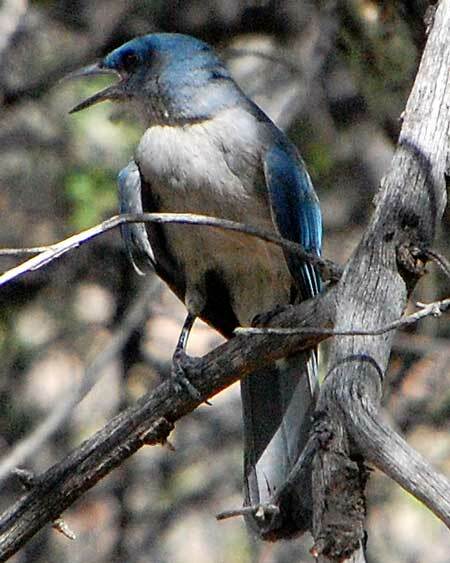 Scrub Jays are also occasional inhabitants of Arizona's sycamore galleries and are similarly colored. Scrub Jays, however, rarely form groups of more than three birds and there is usually some streaking visible on the chest. The chest feathers of Mexican Jay are almost uniformly pale gray.